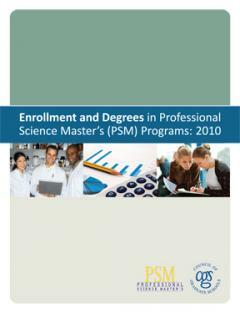 The 2010 Professional Science Master’s Enrollment and Degrees Survey is an annual survey of enrollment and degrees in Professional Science Master’s (PSM) programs. Previous PSM enrollment and degrees surveys were conducted for academic years 2008 and 2009 by NPSMA, the National Professional Science Master’s Association. The revamped 2010 survey was carried out by CGS with a grant from the Alfred P. Sloan Foundation. It collected data regarding applications, first-time enrollment, total enrollment, and degrees awarded.